Despite this proximity to the centre, the layout of the hotel, and the surrounding roads, is quite extraordinary if you are trying to get to it on foot. The hotel entrance doesn’t face onto the street; you can only access it from the car park at the rear. A hotel next to a road. But no entrance. This meant that I cycled straight past it while I was trying to find it. If you are attempting to walk to this hotel from the north, the direct route – of just a hundred metres or so – becomes an extraordinary meander, thanks to a combination of bizarre building design and enormous roads with limited crossing points, that force you take a hugely indirect path. The blue arrow – the direct path. The red arrow – the actual walking route. But this isn’t even the worst example of this kind of ‘design’ I’ve encountered. An even more preposterous example can be found in Crawley in West Sussex, right in the centre of the town. 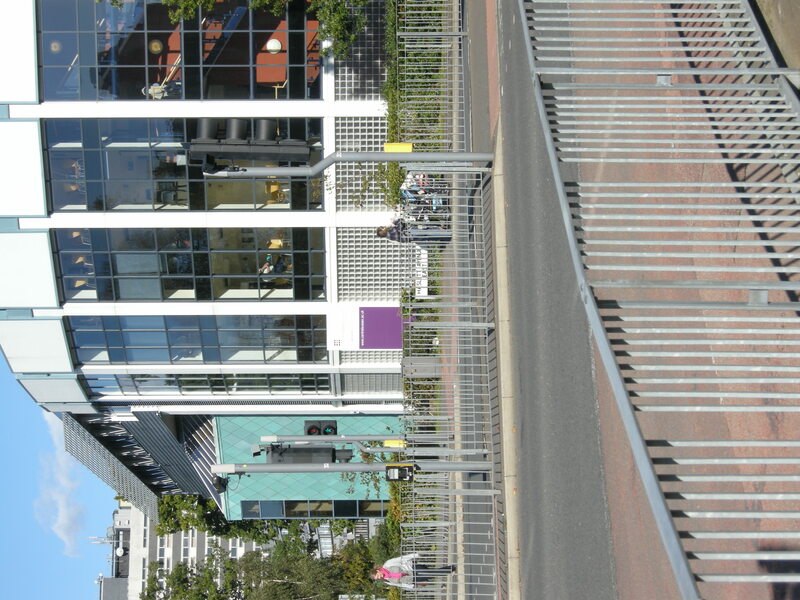 Central Sussex College is adjacent to the main shopping centre of the town, separated from it only by College Road. You can see it, only a matter of tens of metres away, when you step out of the County Mall shopping centre. There it is. So close. And yet (as we shall see) so far. But just try to walk there. Again, blue the direct route. Red, the designed route. Six (yes SIX) separate crossings, followed by an infuriating diversion all the way around the building to enter it from the car park. What is amazing is that this is (amongst other things) a college for 16-18 year olds – so a considerable proportion of the people attending it can’t even drive. Yet the obvious and easy way to access the building – on foot – has been simply been ignored, and made about as difficult and circuitous as possible. Let’s take a closer look. The corner of the building that faces the town centre – where the entrance should be – isn’t even being used. 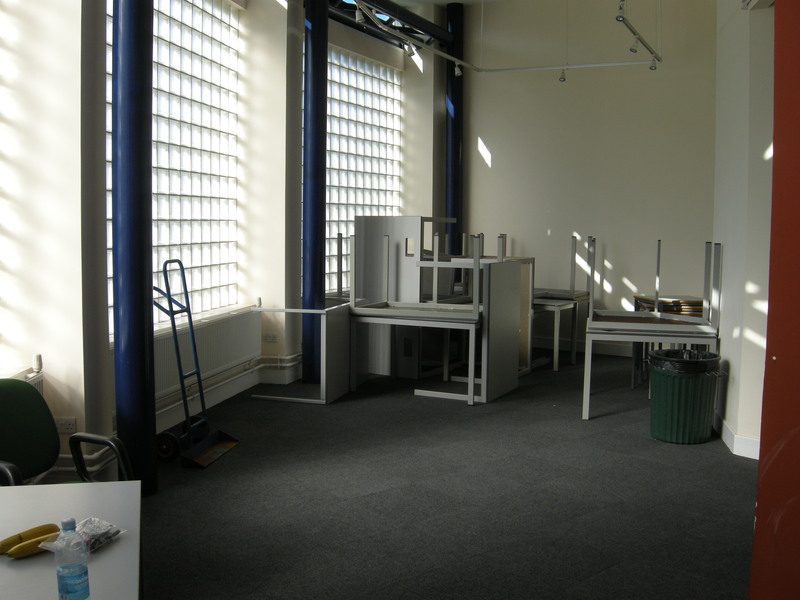 It’s somewhere to stack chairs and tables. Could this be the actual entrance? There should be an entrance here, facing the town, but evidently that was just too obvious. Some opaque windows combined with dead space are plainly much more important. Here’s another view of where that entrance should be, through a sea of pedestrian guardrailing. Incredibly – once you manage to cross the road – you will find that the building is further protected against attack by pedestrians, with armco barriers. 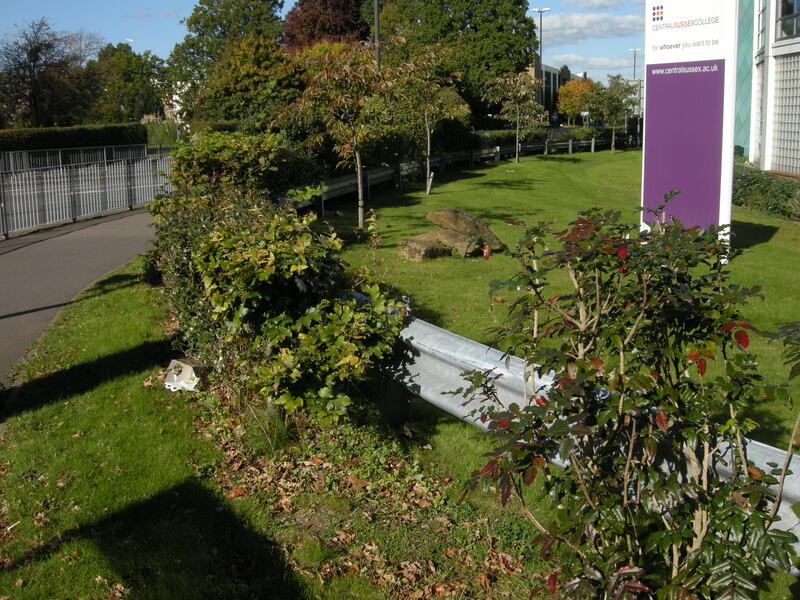 ARMCO BARRIERS. Presumably in case a ‘car loses control’. 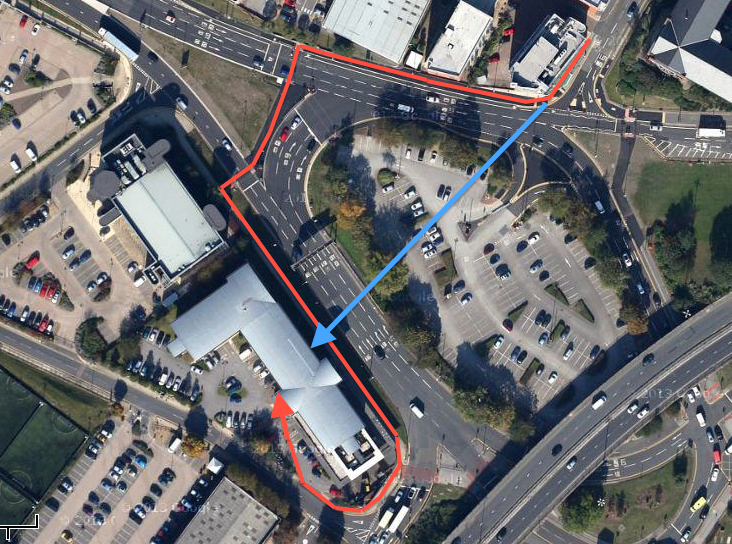 This ring of crash protection extends right around the building, right around to the car park entrance to the north east (top right in the aerial view). Note where it lies in relation to the pavement – pedestrians are expendable. They even had a spare bit left over – it’s been put to good use, protecting another bit of the building from speeding vehicles. The final insult? There isn’t even a footway through the car park to the main entrance. You have to find your own way through the motor vehicles. The rear. The entrance is in the corner. Amazingly, this building was opened in 2006. 2006. Hang your heads in shame. Plain evidence of design failure, right in front of those responsible. This entry was posted in Absurd transport solutions, Car dependence, Town planning, Walking. Bookmark the permalink. Leaving aside cycling for a moment I do find the design of modern buildings and estates hopeless when considered from a pedestrian point of view. They are designed such that you arrive by car, and you leave by car, and that’s it. Instead of pedestrian and vehicle access being considered in parallel you’ve got vehicle access as the only concern and foot access pushed in around that, somehow. There are pedestrian paths, but, lets say you’re staying at the travelodge and you want to go to KFC for a tasty bargain meal.. you have to walk on the road to get past Pizza Hut, and there’s no reason that should exist except that the designers didn’t consider people might want to walk from one place to another. 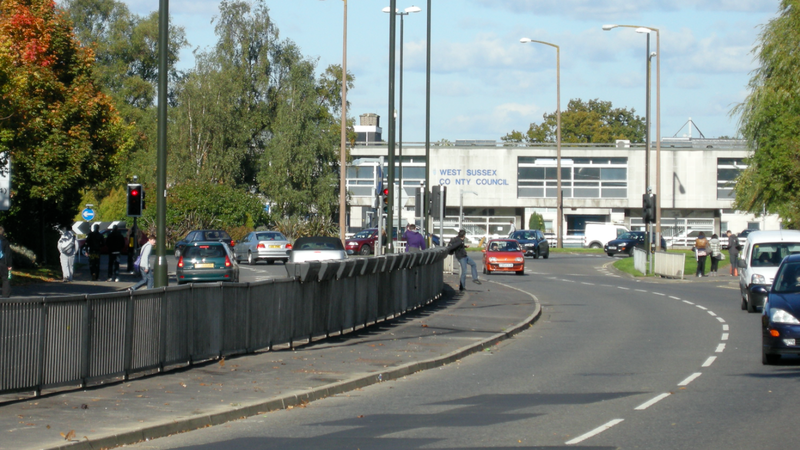 Even worse; if memory serves the signalised crossing of the main road was a retro-fit, I think all there was originally was a refuge (if that) to cross a busy road – there is a rat-run through the nearby housing estate that attracts significant commuter traffic avoiding the queues on the Ring Road. You mean outside Sainsbury’s? Yeah the lights there are fairly recent, I remember them being installed. How is it that we have stringent disability access regulations but nothing for people on foot. A safe pedestrian route through a car park should surely be a legal requirement. This is an excellent point, and one that also applies to cycle infrastructure. Where wheelchair users and mobility scooter users are properly considered as well as pedestrians you start to think about protected space for slow-moving, wide, wheeled vehicles. If this is separated from traditional narrow pavements by a low but manageable kerb suddenly you have a protected cycleway. We’ve been trying to get something done about this crossing for years. What makes it worse is that each lane is a separate cycle – it takes ages even to cross one section/road. Of course, WSCC have designed this road as a dual carriageway and are only interested in traffic flow figures (that don’t include either cyclists or pedestrians). And buildings are commonly designed with car access only in mind. Ah, Leeds! How I miss it. I really did love the place but my 20 mile round trip to work and back always was a feat of cycling resilience. You’ve described the beast very well. And as you go on to show, it isn’t just Leeds, is it? The whole country is full of the same sorts of junk. The very recent House of Commons Transport Committee Report “Better Roads” (download from http://www.publications.parliament.uk/pa/cm201314/cmselect/cmtran/850/850.pdf) is a near-perfect expression of the taken-for-granted motorist mindset of people whose lives are imagined from the inside of a car. Search for “cycling” and “walking” in that “Better Roads” document and you might as well have searched for “throat singing” or “newt catching” for all the insight you discover. Professional people have designed this stuff but professional people need serious and continuous professional development. I suspect that many are not getting it. Planners and architects are the ones whose well-informed expertise should already be normal in current urban design. Enthusiasts and outsiders like mere cyclists and pedestrians should not have to make such a fuss about their needs. Professionalism should be about meeting “user needs” and far more should be done to find out what those needs are. The ideas have been around for decades. It should not be difficult to integrate them into practice. I do suspect, without any evidence, that the most important professionals involved in such dreadful designs are accountants, whose clients do not include “everyone” or “people”, let alone “people on foot” or “people on bicycles”. The professional bodies of which I am a member require continuous professional development and they check regularly to make sure it happens. Otherwise I don’t get to keep their letters after my name. Clearly some professional bodies are more thorough than others because these designs are truly appalling. This continues the proud tradition started with Brent Cross shopping centre, opened 1976. You can get there by car or bus, but that’s it. What a shame it’s the “U” that fell out the council sign and not the “O”. Every time I visit places like this, a piece of me dies. It’s heart breaking the way they have designed humanity out of our streets. It’s one of the reasons I won’t live in the North, it’s even more car centric than the south or East Anglia, where I live – the best thing about East Anglia is because it’s 50 years behind, we have rubbish roads rather than all that dual stuff you yet in more ‘modern’ parts of the country, and (sorry to keep banging on about it) why I’m leaving the UK altogether, it makes me so sad and I feel powerless to change it. The armco barriers are very impressive. Interesting that they’re not there to protect pedestrians from traffic – the barrier between the pavement and the road is only intended to stop pedestrians getting onto the road (presumably to protect the traffic from pedestrians). 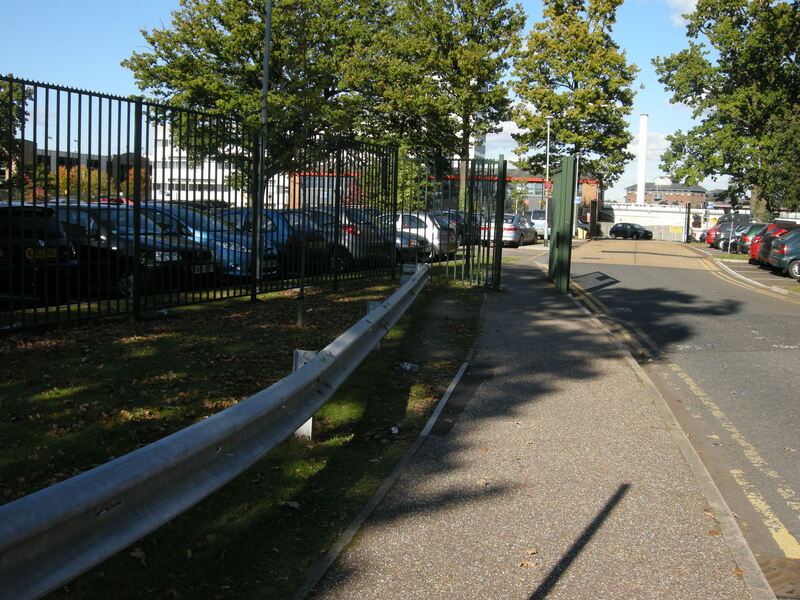 The armco and the railings are actually there to keep the pedestrians in a small, narrow strip so it’s easier for motor vehicles to crush them! 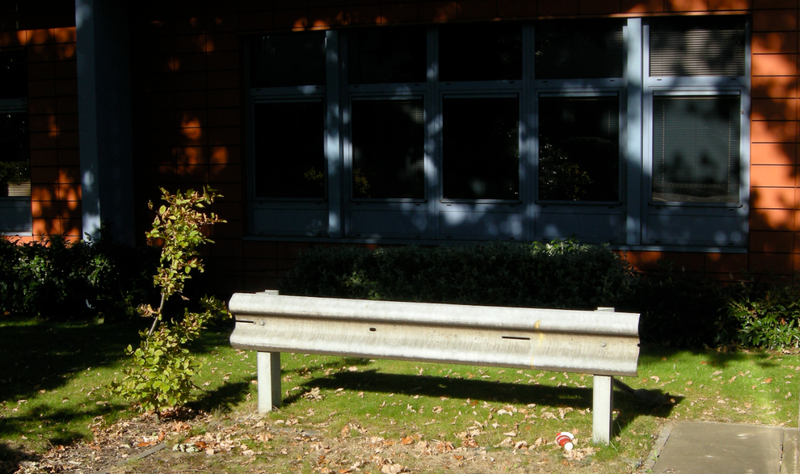 I hate armco barriers – they’re a dangerous trip hazard. When I was a teenager a drunken friend pushed me over one not realising there was a 15ft drop on the other side; after all, what kind of idiot would put a knee high barrier in front of a 15ft drop? The paramedics who lifted me out were surprised too. Good, but very depressing, post. Lots of developments seem to have that ‘entrance through the car park only’ approach. Is this down to incompetent architects or are they only following the client’s orders in these cases? Both; but the main issue is that buildings such as that have to have one controlled access point for people to enter and leave. The reality is most do arrive by car. I just remembered a Premier Inn I’ve visited for lunch https://www.google.co.uk/maps/@54.546265,-1.333016,3a,75y,140.52h,87.35t/data=!3m4!1e1!3m2!1sF2xTrXD1eZCxCUE9S7-q7w!2e0 the only reasonable way in on foot is to climb over the fence! Is that a self-fulfilling prophecy though? “People will arrive by car, so let’s make it impossible to arrive any other way” vs “it’s impossible to get there without driving so I’ll get in the car.” There’s no reason for having one controlled access point – it isn’t a high-security building, or being used for something that requires high security. Give people actual choice in their travel. Those buildings & road layouts were done before Britain was in the grip of a cycling revolution. With sustainable transport being uppermost in everyone’s mind it would be a completely different approach to urban design now. Well quite, we’ve learned nothing, and Durham isn’t even the worst for it. This is really shocking. I live in Utrecht (the Netherlands), and we like to complain about how the town planners ruined our city for us in the ’70’s, and we still have to live with some remains of it. But your town planners are still at it! I am never complaining again. 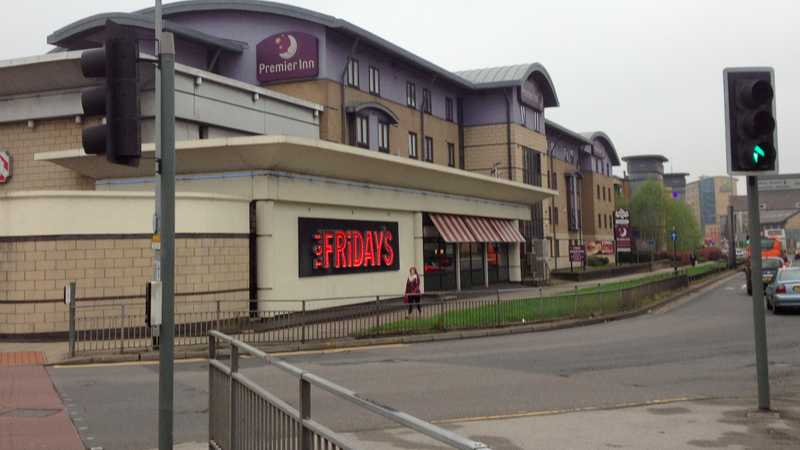 The Premier Inn entrances and crossings are fine for a motor inn where 99% of guests will drive there. The minimum number of crossings possible is 2, and that’s what there is on the safest and least disruptive stretches of road. It’s just an extra two minutes of walking. 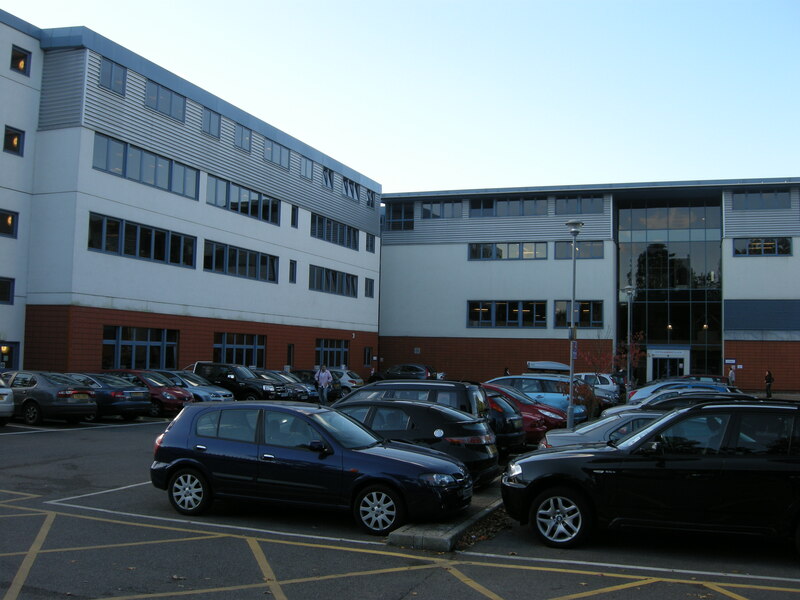 The Central Sussex College on the other hand is just crazy. It’s a city centre hotel. Plenty of guests will come from train station, for example. And why stay in the city centre if you don’t have business there? Likely to be walking to your ultimate destination. Agree that the college is an insult. Don’t these places have to compete for 16-yo students? I bet there isn’t any way near enough parking for all those old enough for a car and many arrive by bus. What is the bus stop->college route like? It’s a travel motel, look at it. Nobody travels around on foot with luggage anymore except backpackers staying in cheap accommodation. People stay there because they do have business in Leeds. They fly in to the airport and pick-up a hire car, or they catch taxis to appointments and restaurants around the city. 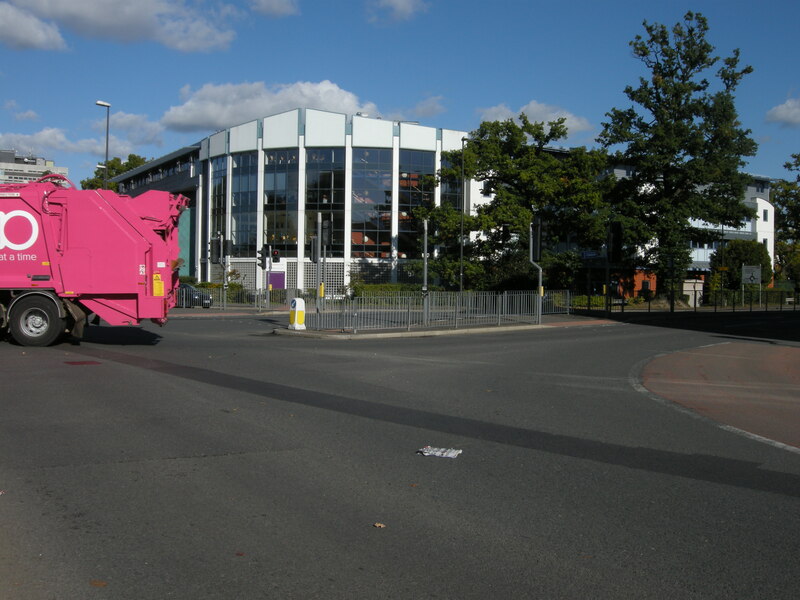 There isn’t much point having an entrance on what is effectively a high speed roundabout. Putting the lights right in front of the inn might save it’s customers a minute’s walking, but it adds a minute’s walking to people using the building down the street, would severely disrupt cars and be very dangerous. I do. I represent a widening group of people who are working on succesful ways of living without a car. It works pretty well. Walking (6 miles yesterday) is part of a healthy and sustainable way of doing things. Buildings like those mentioned are a barrier to those with cars and those without. They are built for corporate profit through cheapskate design and not for public utility. It’s actually just a ten to fifteen minute walk down Wellington Street from the railway station. Drive past early on a Sunday morning and there’ll be plenty of male and female groups (stags and hens, presumably, or maybe just casual drinkers), trailing luggage of various kinds walking from hotel to station. Obviously we’re still stuck in the two-thousands up here (though we do have those taxi efforts). “It’s just an extra two minutes of walking.” This is the exact attitude that needs to be broken. Apply it to motor vehicles and suddenly you become unreasonable and are at war with the motorist. 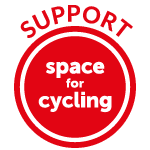 Apply it to overtaking – cars won’t wait until it’s safe, or stay behind as cyclists roll up to red lights even though it’s just 5 seconds of driving, which takes no physical exertion at all. Apply it to pedestrian crossings – it’s just 2 minutes of waiting – and suddenly it’s people walking that are causing congestion and disrupting the smooth flow of traffic. Hmmm… I thought walking was a sustainable mode of transport, that was available as an option to almost everyone, including children, and thus one that should be facilitated, if not actively encouraged? In contrast, motoring is horribly inefficient for local trips and very unsustainable (pollution, energy consumption), and thus a mode of transport that should be given a lower priority, if not actively discouraged. The more people who walk, the fewer cars on the road, the less congestion and pollution and danger. The more walking, the healthier the population, and the obesity epidemic is reduced: saving our NHS a small fortune. A large number of car trips are less than 2 miles long, and many even shorter. We need to make it possible, even pleasant, for people to walk these distances. It doesn’t take much: make the walking and cycling routes pleasant and safe and convenient and direct. Make the motorists go the long way round. That tips the “how shall I travel” decision the right way (along with the high car parking costs and traffic congestion that we already have). There is a small group of convenience shops near where I work (in an edge of town location) and the design of the entrance is very silly as there is no way to get in directly off the street as it’s a 4 foot high wall all along the front – the only way in is to walk all the way round to the back and then through the car park and finally actually into the shop. Ugh! This kind of motor-centric (and visually / emotionally unpleasant) design is rampant throughout suburban areas in the US. And many of the same areas have few, if any, sidewalks. I once stayed in a hotel in Pennsylvania that had restaurant/pub just across the street, but one had to walk around the building, through the parking lot, and then to the corner to get past fencing before even thinking of crossing the street. It’s as if the designers are opposed to people walking. At all. Infuriating.